While each state has its own state-funded animal control shelters, it is the invisible small army of volunteers, who tirelessly labor at taking animals’ pictures, write their descriptions and manage those shelters’ websites without any pay. Those are shelter volunteers. To me, theirs is the hardest job of all. They visit shelters as often as possible, form bonds with the animals, learn all they can about them to then send that information as a kind of electronic message in a bottle to those who might listen. How they survive it when a dog or a cat for whose life they pleaded for gets put down is beyond my comprehension. With all the information sent out into the ethos of the Internet, it is crossposters who take over and serve as the bridge between a certain death and a possibility of escape. These angels gather as much of the sent and posted information, repackage it, to email and re-post it to personal emails, countless geographic and breed-specific forums to achieve farthest reach possible. These people have day jobs like the rest of us, and do their bit during stolen moments of free time. Their emails/postings are received and mulled over by the rescue organization representatives. 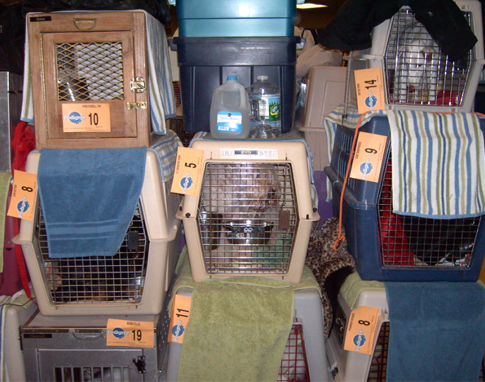 To understand their hellish decision-making undertaking, it helps to know that most rescues are run like any other business where inventory is king. If you have no space to house your inventory – you can’t accept any more shipments. In rescue lingo that precious space are your fosters and your kennels, so once requests to save are received, another wave of electronic communication confirms that space’s availability. Only after that do shelter volunteers and crossposters get a resounding response “yes, we’ll take your death row Fifi”. You’re thinking “Success, Fifi is saved”, but that’s not the case yet. Fifi needs to be “pulled” from that shelter and somehow be delivered to its temporary home. That is when transporters raise their hand. Across the entire country, via internet groups and chat rooms, there exists a separate network of people who do nothing, but transport animals to safety and their new lives. These are truckers, vacationers, commuters, rescuers, students coming home for a visit, etc. They log in, and self-identify which leg of the trip they can commit to and when. Nobody here gets paid or even reimbursed for any purchased gas. An average trip for these folks is 50-60 miles, until the designated meeting place where crates with precious cargo are handed over to another transporter, all the way, until Fifi gets delivered into the hands of the rescue that claimed her. This is where fosters do their part. Remember those quick videos and descriptions shelter volunteers sent out into the world? Well, for most fosters, that is all the information they will have before they set their eyes on a crate where both terrified and exhausted Fifi has spent the last 6-10hrs getting transported. Being a foster, I can attest that it is both exciting and a bit scary to first discover what animal will call your place its home. To cut down on the unknown, many fosters chose to specialize. Some prefer to house larger breed dogs, some – smaller. My rescue has several ladies who take in nothing else, but puppies, for they love to nurse them to health and house-train them. Even I pick dogs I believe I am most effective with, the kind others call “the question marks”. If the original description describes any erratic or fear driven behavior or if in that video you hear growling or terrified squealing – those are my kinds of dogs. But, Fifi’s story is far from over, for to be adoptable, each dog has to be vaccinated and hopefully groomed. Did you know that there are thousands of veterinary technicians and veterinarians who work together with an army of groomers and trainers, who offer their services tirelessly to treat these refugees? The animals undergo required shots, complicated surgeries, spaying, neutering, nail clipping, fur washing and basic obedience training? More so, if foster space is full, some animals will be sent to local kennels, whose owners are ready to step in to give them food, shelter and exercise? All of these people are volunteers, teachers, mothers, students, computer engineers, executives, and every other kind of lunatics, who want nothing more than to save a life, two lives, maybe even more. I recently read about a club of pilots, who decided to volunteer flying various dogs across state lines to their new homes? No to mention countless hours they spent putting together and formatting marketing materials and websites? Or, the herculean effort it takes to fund-raise to cover medical bills and get the word out so that regular people can be intrigued and interested in any of the animals? All that heroic work - just so you can walk by an adoption fair one day, glance at poor Fifi and forever fall in love with your new best friend, while the underground railroad of tireless individuals leaps to try and save Fifi number 2 from the jaws of death.